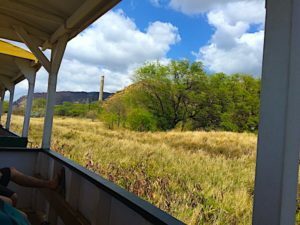 The historic Oahu railroad is on the leeward side of island. 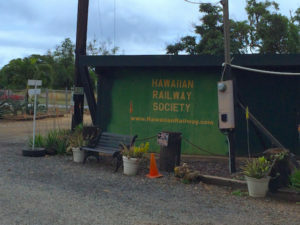 Some of the original Oahu railroad track is maintained and restored along with 3 diesel locomotives by the Hawaiian Railway Society, part of the National Railway Historical Society. 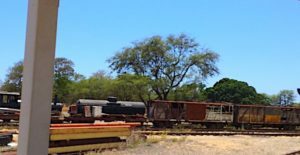 Rail was an important part of the sugar plantation times and some of the vintage cars and engines you see were used on plantations such as Ewa and Waialua Agricultural. The Dillingham name is seen all around Oahu: Dillingham Highway, Dillingham Ranch, and he created the famed Hale’iwa Hotel. Benjamin Franklin Dillingham made Oahu his home after the Civil War and founded the Oahu Railway and Land Company (OR&L). The railroad was used to transport sugar and pineapples from Honolulu all the way to the North Shore. 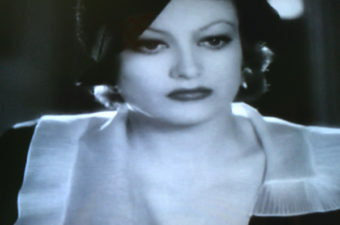 The Hale’iwa Hotel was a resort getaway for folks in Honolulu and gave his railroad passengers. 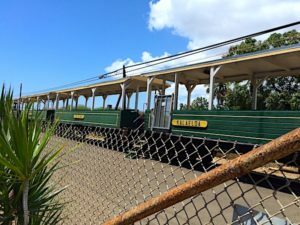 Today, thanks to the Hawaiian Railway Society, you can take a ride on a section of the OR&L tracks from Ewa through Ko Olina to the Hawaiian Electric Beach Park. 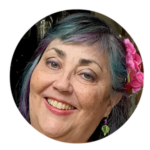 The ride is about 90 minutes round trip. The train leaves at 3 pm Saturday and 1 and 3 pm on Sunday. You can purchase the tickets at the depot. 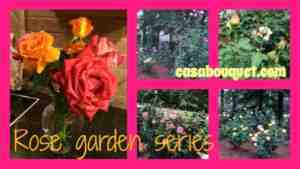 Check the website for the fares. The cars on the train are open with benches facing outwards. On the first leg, try to get a seat on the right side or close to the end so you can enjoy the scenery. You’ll see all ages on the train. You may want to bring a drink and a snack. The two 3 pm trips stop at the ice cream shop in Ko Olina (the track is right in front of the shopping center!). As you ride along, you can listen to the narration of history and sites to notice. First you pass through the society’s train yard and see the old engines and cars they’ve collected and are working to restore. 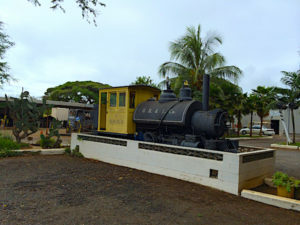 The train travels through Ewa Beach, then Kapolei. 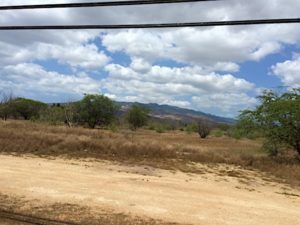 Then you enter the countryside with views of the Waianae mountain range and Makakilo. 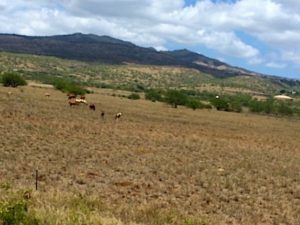 As on all the Hawaiian islands, the leeward side is drier and has grassy plains. Horses graze on the grassland. Next the train enters Ko Olina and runs right through the golf course. 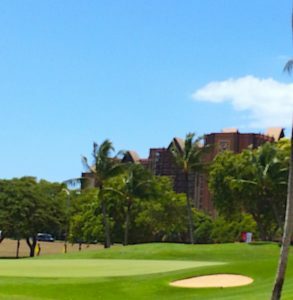 This is a fun way to see the resorts and get a sense for how Ko Olina is laid out. The end of the line is near Kahe Point Beach Park. 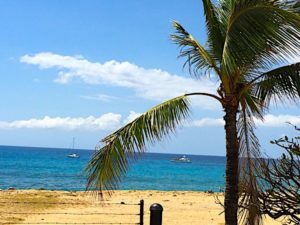 You’ll see beautiful ocean and the Hawaii Electric Power Plant. The train stops for a few minutes here so you can stretch your legs on the beach. The return trip follows the same route back to Ewa. Try using your favorite app to search for Kapolei and Ewa Beach. Also, there are lots of places to eat at the Ka Makana Ali’i Mall or Kapolei Commons. From Waikiki, take Ala Wai Boulevard to McCully Street. Follow the signs to H1 going west (Ewa). Stay on H1 through Pearl City, Waipahu, and Ewa. Take Exit 3 to head south on Kualakai Parkway. Turn left onto Kapolei Parkway. 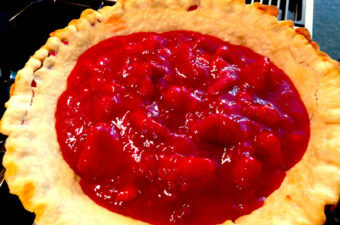 Turn right on Renton Road. Turn left on Phillipine Sea to enter the parking lot of the Hawaiian Railway Society. Ok, I could seriously use a dose of Hawaii right now! It was 11 degrees here in CT this morning! Hey Becky! I’m still snowed in in NC too! I sure would like to be on the little train right now, feeling that Hawaii breeze in my face!